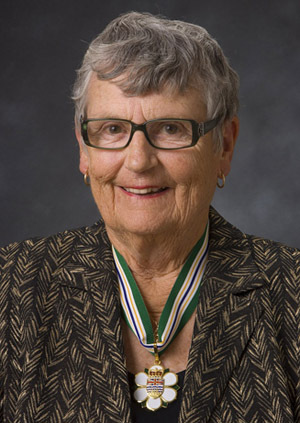 Patricia Proudfoot is a retired Justice of the B.C. Court of Appeal, who served with distinction as a judge on all levels of court in B.C. She was the first female judge appointed to the Criminal Division of the Provincial Court, the County Court of B.C., and the B.C. Supreme Court. Judge Proudfoot was appointed to the B.C. and Yukon Territory Court of Appeals, and sat on the first all-female panel of that court. She was also appointed Deputy Judge to the Supreme Court of the Northwest Territories. Mrs. Proudfoot has served her community in many capacities, including as commissioner to the Royal Commission into the Incarceration of Female Offenders, and a member of the Committee on Sexual Offences Against Children and Youth. She also serves on the Canada Pension Appeal Board, and has served on the Canadian Panel on Extraordinary Challenges for NAFTA. She is an honorary director of Big Sisters of BC, demonstrating her belief in the important role of mentorship between women and young girls. Throughout her career, she has served as a mentor for many women and men in the legal profession. The best evidence of her ability to lead by example has been the increasing numbers of women who have followed Judge Proudfoot onto the bench. Mrs. Proudfoot has made a profound contribution to the legal profession, to family law in British Columbia, to her community, and to those who have worked with her over the years.